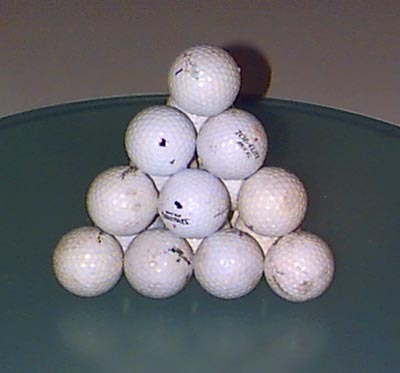 Consider 20 balls arranged as a triangular based pyramid, that is, 10 balls on the base, 6 balls on layer 2, 3 balls on layer 3, and finally one ball at the apex. The aim was to join various balls together so as to make an interesting puzzle. 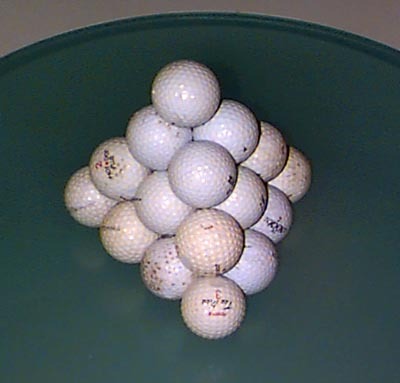 A 3D modelling and rendering package was used to determine how to join the balls together before building the model out of golf balls. 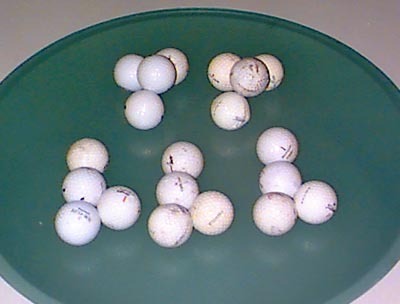 The following shots show the configuration of the golf balls joined together in groups of 4. There are two different groups, with 3 of one type and 2 of the other type. The main trick when joining the golf balls is to drill into the balls a short distance and insert/glue a metal pin, this is the easiest way to give the groups of balls the enough strength. And finally, the solution although if you go to the trouble of making the model you will generally not have a problem solving it.